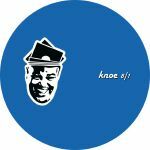 Review: For Those That Knoe continues in its quest to shine a light on criminally overlooked gems from the vast archives of house and techno, this time looking to the early 00s era of minimal house and the little known Swiss producer Canson. Using crisp, clicky rhythms as a backbone and embellishing the tracks with gorgeous bluesy synth touches, this is classy, understated stuff for the warm up or trip out crowd. "Newton" lets the chords linger around a robotic gurgle of percussion, while "Lachgras" takes a slinkier route into nocturnal keys clipped for maximum minimalisation. "Flause" edges towards dubbier territory with its subtly shifting tones, but the slinky house groove remains a constant as it ticks away underneath the shimmering textures.